It has been more than 10 years since I attended last Green Festival. I wasn't planning on going when I saw the admission being more than $10. A few days ago, I got an email from Goldstar offering free admission to Green Festival. It was just my luck that I checked my email the minute I received the free offer, so I grabbed a weekend pass for $4.75 of "service charge." I have been a member of Goldstar for many years, and I receive discount and free offers around the Bay Area on a weekly basis. For free offers, they are limited quantities and Goldstar charges a "service fee." That was why I had to pay $4.75 for my free pass. I was amazed at the huge turnout of participants. I don't remember this being such a huge event last time I attended it. People lined up outside all the way around the corner before 11 a.m. Once inside, there were countless food samplings and product samples free for the taking. I got many dog food and treat samples including 4 packs of different dog food varieties from Spring Naturals. I also got a pack of vegetarian dog food. I am curious to find out whether Kelsey will like that. At 4 p.m., I sat down in front of Main Stage to listen to California's non-GMO leaders talking about "Beyond Proposition 37: What's Next for GMO Labeling." Last Tuesday was election day, and to my surprise, proposition 37 didn't pass. I couldn't fathom how it didn't pass. Today I found out that heavy advertising campaign opposing 37 was on TV and radio just a couple weeks before the election day. Apparently, every commercial break during World Series was "No on Prop 37." I would have never known since I don't watch TV nor listen to the radio. It's just shocking to me that majority of Americans would rather not know what they are eating. On second thought, there are still plenty of people eating McDonald's hamburgers everyday, so I guess majority of Americans just want cheap food. Ford was one of the event sponsors, and many of their electric and hybrid cars were on site for test drive. They were even giving away SustainU (100% recycled apparel made in the USA) T-shirts just for test driving the cars. I rode in Ford's 100% electric car and was quite impressed. I wonder whether electric pickup trucks will become available soon. Around 5 p.m. I headed home with bags of samples. Perhaps next year I'll sign up as a volunteer for Green Festival. 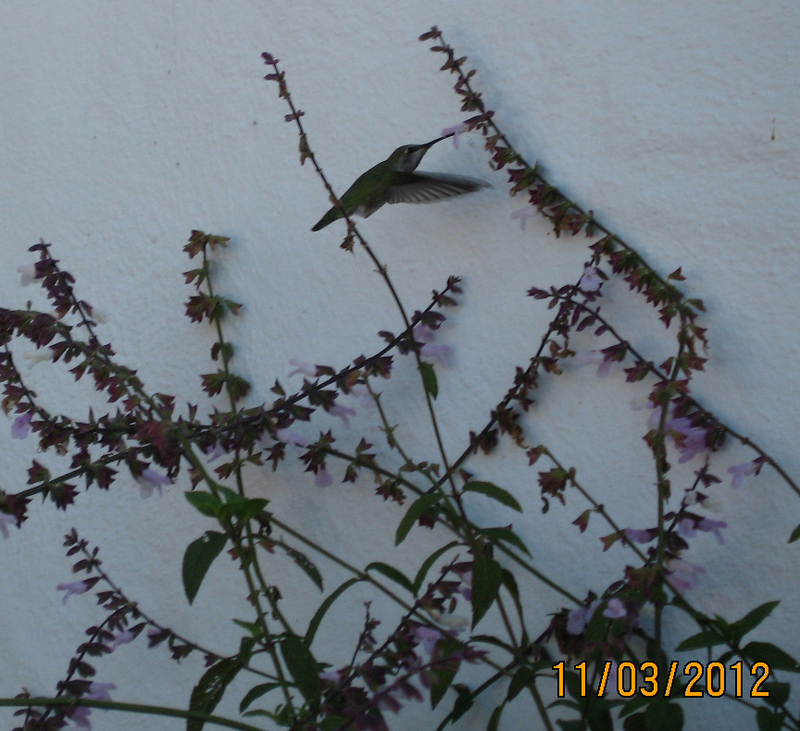 I planted a bunch of Mexican Bush Sage when I hired Backyard Food Gardens back in November, 2010. 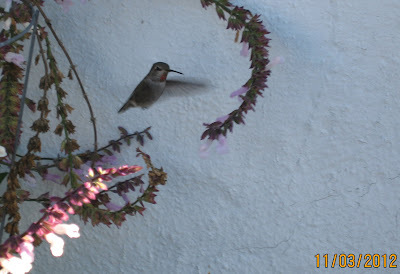 I like these plants because they are drought tolerant and have colorful flowers in tubular shape which hummingbirds love. 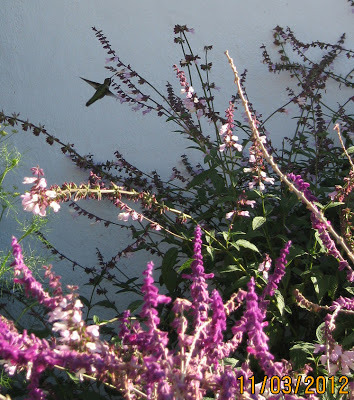 Even though these flowers are not edible to me, they provide a food source for the birds and bees, and I like having the birds and honeybees in my garden. 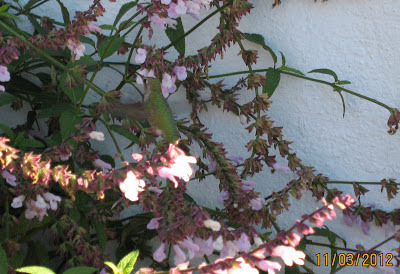 Hummingbirds do indeed visit Sand Village Farm frequently. Sometimes they get trapped in the garage, sometimes they just rest on the clothes lines I put up. Yesterday morning, I saw two hummingbirds resting on the 2 clothes lines, one on each line. One bird had a red head while the other was all green. I wanted to take a photo, but I knew that they would just get startled and fly away, so I went outside to take photos of my passion fruit vines instead. Suddenly I heard this noise that sounded like a giant bumble bee zooming pass me. Sure enough it was a hummingbird. It was the red head. I snapped a few pictures of it, but it was move quite rapidly and always behind some flowers. 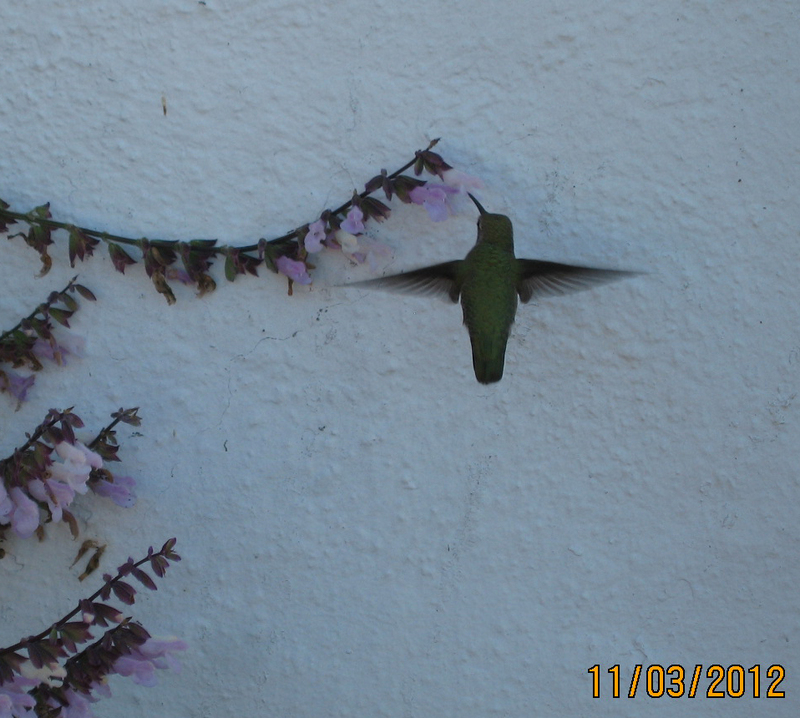 As it flew away, the green head hummed its way over, so again I tried to take a few shots. This time I had much better luck. As the tiny bird feasted on the nectar, I got many clear shots although it stayed in the shade most of the time. I visited the 3 chicks next door on October 12th. Today I went to see them again, and they seemed to have doubled in size once more. They are starting to look like chickens although they still make the cute baby chick noise. As usual I picked one up and held her on my chest. It has so much more feather now. She's warm and fluffy. As soon as they saw me, they just stood in place staring at me. As soon as I stepped away further, two of them started to run around in the small coop and playing with each other. They can make big noise as they jumping up and down in the wooden coop and pecking on the metal heating lamp. The owner of the chicks are planning on moving them outside into a bigger coop this weekend because they are just getting too noisy and messy in the small confinement.